The main perk of vegan cookie dough is that it can be safely consumed before baking- due to it's egg-free nature. 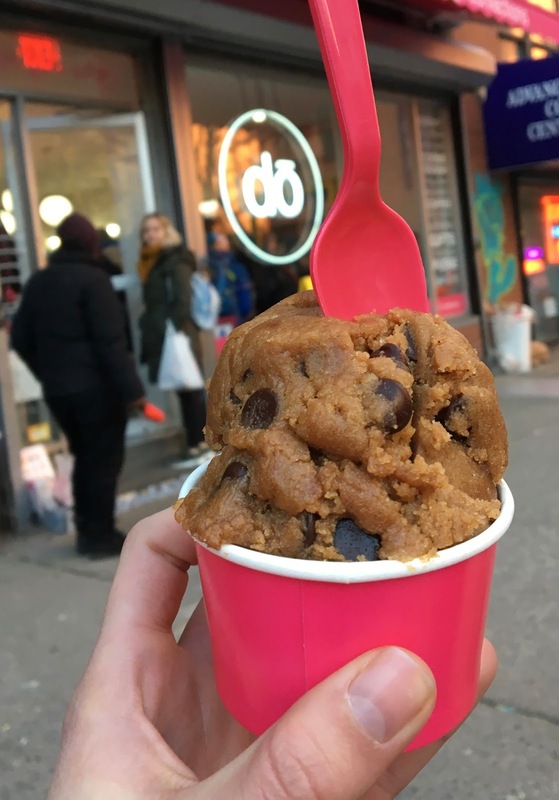 While it's commonplace to sneak samples of raw dough when baking in your own home, DO, Cookie Dough Confections in New York City has decided to dedicate a whole shop to the enjoyment of raw cookie dough. With tons of sweet options and decadent ways of consuming cookie dough (sundaes, cones, etc. ), DO is a sweet place to satisfy your sweet tooth. 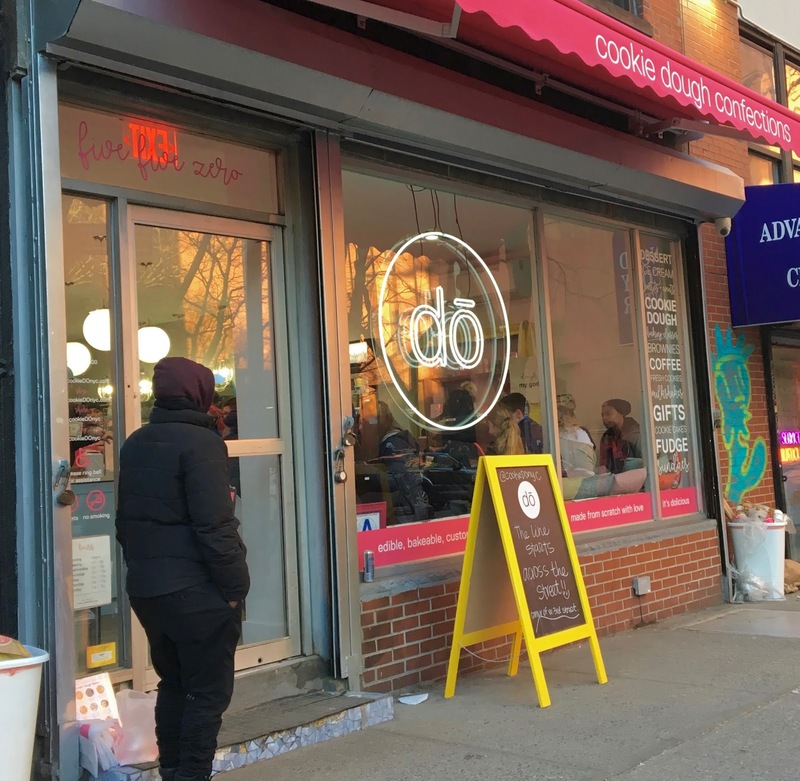 Located in Greenwich village, DO's location is a nice break from the ceaseless sights and sounds of midtown/Times Square. Near Washington Square Park and NYU, it was nice to stroll through the neighborhood after visiting the shop. A word to the wise before you go though- this popular dessert emporium has been known to draw quite a crowd in its early days. When I visited- early evening- the line was down the block and they were letting people in in groups to avoid crowding the store. The only gluten-free dough flavor that is both gluten-free and vegan is the peanut butter snickerdoodle. It features a peanut butter cookie base with cinnamon sugar and chocolate chips mixed in. I confirmed that they use separate mixing bowls/equipment to make gluten-free batches and sanitize the equipment before mixing to prevent cross contamination. In-store, I requested that they scoop my portion with a fresh scoop and the staff member I asked happily complied. I got one scoop of peanut butter snickerdoodle, which was generously mounded on top. Although it looks like a small portion, each bite goes a long way because the dough is so rich and sweet. The chocolate chips add a richness to the mixture and add crunch to the sticky dough. It was a little less peanut buttery than I was expecting, but it did nail the snickerdoodle hallmark of cinnamon and sugar. I ended up eating just a few bites of the dough at the store- I nibbled on it throughout the evening to space out the sweetness. Ultimately, the dough was just too sweet for my liking and I could not finish it off after multiple attempts. Although I was bummed I had to through half of it away, it was cool to partake in the novelty of a raw cookie dough bar. The only downside is that gluten-free and vegan options are really limited. 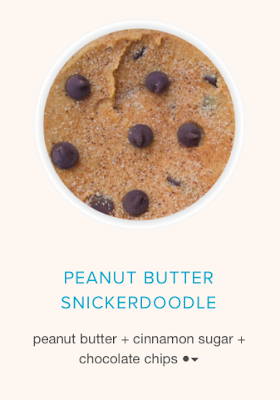 Hopefully the cookie dough engineers will be able to concoct more flavors in the future.